This past December 2016, Monsanto shareholders agreed to the sale of their company to German Agro-chemical and seed company Bayer, for $66 million US Dollars. It will be the largest ever foreign corporate takeover in US history. The newly merged company will now control 29 percent of the world’s seed markets, and 24 percent of the world’s pesticide market. 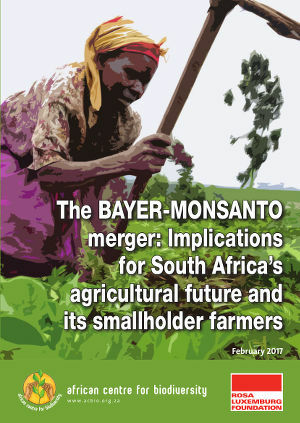 AGRA Watch partner The African Centre for Biodiversity (ACB) with the support of the Rosa Luxemburg Stiftung Foundation, has published a paper called, ‘The BAYER-MONSANTO merger: Implications for South Africa’s agricultural future and its smallholder farmers”, outlining the proposed merger. ACB is headquartered in South Africa, where Bayer and Monsanto are major actors in the seed and agrochemical industries. This deal will require approval from about 30 regulatory agencies around the world, including the South Africa’s Competition Commission. This entry was posted in AGRA Watch, Bayer, Mergers, Monsanto, Shared posts from other blogs. Bookmark the permalink.